After seeing his models wear Crocs, which ranged from brown marble to a mustard-yellow with quartz Jibbitz (button like accessories that fit into the holes), I think it’s highly possible we could see people wearing Crocs for the first time in a long time. I considered buying Crocs just so I can get cool quartz Jibbitz like the ones in Kane’s show. Crocs are making a trendy comeback in the fashion world only because of what fashion means today. Fashion now is a lot more freedom for creativity and detail in what you wear. Mixing patterns and adding accessories, such as big, almost childish dangly earrings or fun and flirty sunglasses are all allowed. It’s been transformed from minimalism to a gaudy self-expression. Items so crazy that they fit together effortlessly. Crocs are just so crazy, so out there, that they just might be adding that perfect touch to an outfit. I remember wearing Crocs as a kid and them being the easiest shoe I could have ever owned. I once even went on a hike in Crocs and I’m still living that down. They were easy and comfy, what more could you ask for? With the right look, Crocs could be very- not stylish exactly- but trendy and unique. I, for one, am all about experimenting with something new and creative. I view Crocs as being a blank canvas for anyone trying to step up their creativity in the way they dress. I decided to test out my idea about Crocs out for myself so that you don’t have to. Also, my Twitter followers told me to buy a pair. I wore my Crocs for a solid week of school (not including Monday because we didn’t have school) and surprisingly didn’t get laughed out of school. For the first day, I wore a skirt with a white tee and a 80s windbreaker and paired it with the white Crocs I bought from the Croc store. Walking into school I was very self conscience because, hello, I was wearing Crocs. I expected a lot of jokes being made about the Crocs I was wearing, so I was somewhat mentally prepared. But, I ended up being surprised. 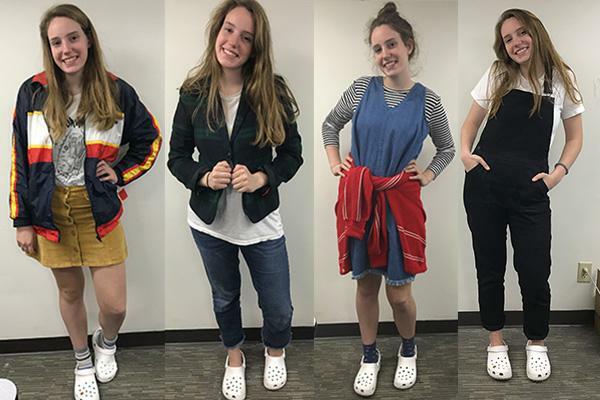 I got a lot of “Why are you wearing Crocs?” to which I would respond, “Fashion does what fashion does.” The week before this I talked jokingly about actually buying Crocs to my friends. When I walked into the high school hallway, I heard, “OMG you actually did it!” or “Camile! Noooo!” in the case of sophomore Day Newman. While the majority of people were confused as to why I was wearing Crocs, some people told me I was pulling the Crocs off. “I actually like the Crocs. You can pull the look off,” senior Maya Mastin said. It wasn’t awful wearing Crocs, they were pretty comfortable. The two little girls I tutor even agreed with me that Crocs were very comfortable. I wore cropped flare jeans with another white tee and a plaid blazer with the Crocs. I felt a little more comfortable about going into school my second day. That morning some sophomore girls got together at McLain’s Market Place before school on a group coffee date with English teacher Kylie Briggs and math teacher Kelsey Duck. While waiting in line to order our food, Duck told me all about how in high school she would dress in weird items of clothing every day, like neon tights under jean shorts just because she wanted to. “I’m just glad you’re wearing what you want to wear,” Duck said. I continued getting asked why I was wearing Crocs throughout the day. I also had people saying, “What are those?” But some complimented them. “Fresh Crocs,” sophomore Marc Trujillo said. “Very fresh,” sophomore Joby Jobson said. Not sure if they were being sarcastic or not… but I’ll take it. I wore a denim dress on top of a white and black striped shirt with a red sweater wrapped around my waist. By this point I didn’t really care anymore of what people thought. I was just having a fun time wearing white Crocs, even though my feet got a little sweaty. Throughout the day people were making their usual comments, “Why are you still wearing Crocs?” or What are those?” etc. I kind of started to laugh at them myself. I mean it was kind of ridiculous, but it was fun. In one of my classes, a couple classmates and I were having a conversation and we brought up what someone was wearing and whether it was fashionable. Then all of the sudden I heard, “You’re one to talk, Camile.” I couldn’t tell if this person was talking about my Crocs or just how I dressed in general. I was just in shock and slightly offended. Over the past couple days these Crocs had become my little babies; I loved them. They were comfortable and dependable. My friend told me to brush the comment off because if I was going to wear Crocs I was would just have to own it. So I did and went on with my day. This was the final day and I decided to wear all black and white. So I wore a white tee with my black overalls and the white Crocs. Simple but chic is what I was going for. It was my favorite outfit the whole week. My overalls were comfortable and my Crocs were comfortable, and I was just enjoying myself. Again there were both shallow insults like “they’re trash” but some people complimented them by saying they were dope. It was the end of the week and all the insecurities I felt about wearing them were gone. Other people accepted them too by the end of the week. “At first I was a little worried, but I think you can pull them off well,” Newman said. “I love them but are your feet sweaty?” English teacher Micah Conkling said. He had a good point. No matter the trends that come in or out of fashion, trying new things is a great thing to do. Whether it’s in how you dress or activities you do it’ll open our minds up to new possibilities and new ideas. It’s always a good way to branch out. Will you see me wearing Crocs in the near future, again? Maybe. Should you judge me or anybody else if you see them wearing Crocs? Probably not. The real question is should you judge anyone for what they wear? Definitely not. The Croc comeback might be the weirdest trend I’ve yet to see, but fashion does what fashion does. Just remember to dress to express, not impress.